After the amazing success of the Water Cube in Beijing for the 2008 Summer Olympics, the aquatic center has been transformed into an incredible (and massive) indoor water park. Rather than just letting the record-smashing facility sit there unused, the owners have transformed the space into the fantastical Happy Magic Water Park, complete with slides, a lazy river, a wave pool, floating jellyfish and more. Now Beijing's second most visited tourist spot (after the Great Wall) is a hot spot for family activity and the largest water park in Asia. The Water Cube, originally designed by Australian firm PTW Architects with the help of Arup, was already an amazing work of architecture that garnered a number of awards and had some record-breaking swimming go on inside of it. With its bubbly facade, incredible daylit interior and energy efficient design, it would have been a shame to let this building just sit there. So we’re pleased as can be that the facility has been turned into an fantastical aquatic playground where families can go and spend time together. Happy Magic Water Park recently opened on August 8th after a year of renovations, led by Forrec, a Toronto-based design firm that specializes in entertainment and leisure facilities. Inside it is a magical underwater wonderland with hanging ribbons, blue bubbles and floating jellyfish. There are about 10 different “rides” including a wave pool, tube slides, speed slides and even a lazy river. Daylighting through the ETFE pillow exterior still plays a major role in the facility and at night, interior lights shine out to illuminate the surrounding area. The Olympic pool is still used for swimming matches, but now the rest of the facility can be used on a regular basis. This is - in my eyes - 'typical' China, having the freedom to create and build without the beaurocratic red tape. I visited the water cube in '10 and what a wonderful example of modern architecture. Just great! Interested to join this experience but the pool is so crowded. 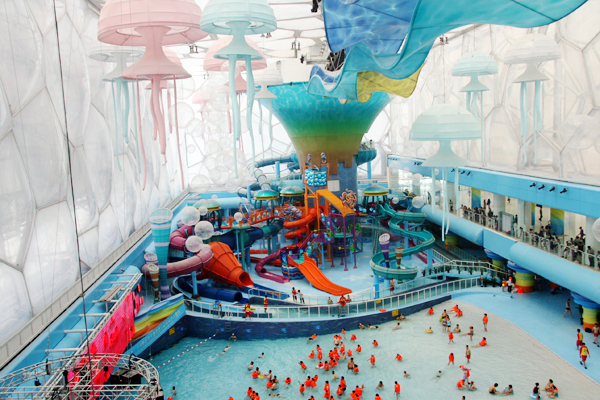 The new water park is now the largest water park in Asia and was designed to make visitors feel like they are underwater once inside the cube. Even before the park opened, the Water Cube was a hotspot for tourists (2nd most visited building in Beijing after the Great Wall of China), and now families will be flocking to the water park for some indoor water fun. The park opened on August 8th, 2010 and includes 10 amusement "rides" like slides, a wave pool and a lazy river. Kids and adults of all ages can enjoy the various attractions. A wave pool generates waves every 10 minutes and then stops so visitors can just relax or lounge in the pool. The water cube is now even more like an underwater experience and is decorated with floating jellyfish, wavy colorful ribbons and hanging bubbles. All of the rides and attractions are located inside the cube. Here the speed slide twists and turns down into the water. Various sized pools allow families to find a perfect spot to have fun with their children. The lazy river winds around the park letting visitors relax in the flowing water. 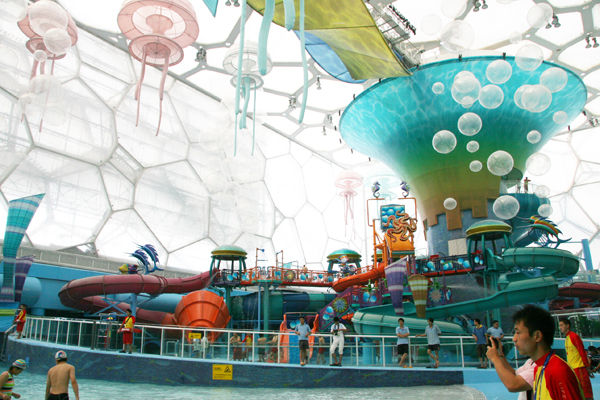 The water park takes advantage of the natural daylighting through the ETFE pillow facade. At night, interior lights illuminate the building attracting attention to its colorful exterior. Forrec, a Toronto-based design firm specializing in entertainment and leisure facilities, is behind the design for the renovation of the Water Cube. We think Forrec succeeded in their goal of making the water park feel like an underwater wonderworld.